Sydney Theatre Company and Barking Gecko Theatre Company present STORM BOY by Colin Thiele. Adapted for the stage by Tom Holloway in Wharf 1, Sydney Theatre Company, Hickson Rd. STORM BOY is a joint production of the Sydney Theatre Company and the Perth company, Barking Gecko Theatre. Directed by John Sheedy from a commissioned adaptation by Tom Holloway, of the 1964 children's novel by Colin Thiele. A film was made in 1976 by the South Australian Film Commission (SAFC) and Channel 7. It won the Best Film Award from the Australian Film Institute (AFI) in 1977, and starred Greg Rowe, Peter Cummins and David Gulpilil. This is the second stage adaptation, The Bell Shakespeare toured a production in 1996. A classic children's novel, a favourite for young and old, had its reputation enhanced with the film and seems to be one of the markers of an Australian education-cultural identification for all generations. I saw a performance on a 'school night', a Thursday, and it was packed with, exactly that, generations of all ages. The following night I happened to be at the Wharf again, and as the theatre bells were ringing, it looked as if another full house was going in - another excited mixture of adults and children. If box office is a signal of success, then, this production seems to have found a cord/ rung a chord - to/of the cash registers (whatever that sound may be today- an internet 'buzz', perhaps?). It is extremely heartening to see these younger people attending the theatre, and hopefully the experience will be a memorable and defining one for them, for they are the potential audience of the future. The recent National Theatre production of WARHORSE, presented at the Lyric Theatre here in Sydney, began life in 2007 as a Christmas holiday production for children and is still playing to packed houses in London and around the world. (the annual Christmas production at the National Theatre has included an adaptation of the Philip Pullman trilogy HIS DARKER MATERIALS - a two play, six hour extravaganza; and an adaptation of a Terry Pratchett novel NATION. These productions are given all-out commitment by the company, there is no expense or effort spared). One of the most striking features of attending the theatre in Great Britain is to see the range age of attentive audiences in the theatre. Last January, the West End Globe productions of TWELFE NIGHT and RICHARD III at the Apollo Theatre; the Complicite production of THE MASTER and MARGARITA, based on the novel by Mikhail Bulgakov (and it was 195 minutes long!) at the Barbican; even, the Royal Court's production of IN THE REPUBLIC OF HAPPINESS by Martin Crimp, a whacky 'Christmas play', was crowded with young audiences - adolescents, in this case, if not children. It seems if you do it they will come. Or, is it a cultural thing? A British phenomenon? So. STORM BOY a great book. A great film. And in this instance we have a terrific adaptation by Tom Holloway that is succinct in its narrative and characterisation whilst still allowing room for audience potential endowment of deep nostalgic affections and/or emotions. It moves forward simply and clearly. The Design of the set by Michael Scott-Mitchell is dominated by an architectural shape, sculptural in impact: one could project the wind and sea eroded cliff face of the sea shore of the Coorong National Park on to the imagery, or, the spooky bones of a giant whale beached, long in the past, on the shore. The properties of the boat, ropes et al allow romantically charged memories and endowments to support the story. It is beautiful in concept,and simply, compactly 'tourable' in execution.The Lighting Designer, Damien Cooper creates moody pictures suggesting the environment that can be beautiful, both, of the severe and serene kind. Accompanied by a Sound Design by Kingsley Reeve, of crashing sea sounds and thunderous storm effects and a hauntingly spare piano score, the whole of the aesthetic choices causes one to almost smell the salt air and the tingling of all that rawness of the remoteness of the setting. The crowning part of the show's aesthetic achievement, however, are the puppets created by Annie Forbes and Tim Denton (Aboutface Productions) under the direction of Peter Wilson: puppets of pelicans, pelican puppets: Mr Proud, Mr Ponder, and the well loved, Mr Percival, from hatchlings to adults and in different actions, flying on the wind, or running amusingly around the ground. They are enchanting, the children around me and across from me, curious, wide eyed and, ultimately, delighted. The production employs two indigenous actors to embody the puppetry and the 'spirit' of the pelicans: Shaka Cook and Michael Smith, and their work physically and emotively, their presence along with the skills and self-identification with the pelican birds, truly spell binds the work into the dream inheritance of the land of the aboriginal Australian. It is palpably powerful. Full of magic and "awesomeness". Mr Sheedy concludes in his program notes, "For my own part, my vision is to introduce this classic Australian story to a new generation, to literally bring these beautiful characters to life ... " Unfortunately, in the present casting that does not happen. None of the human characters in this production are life-like at all. The young actor playing STORM BOY, at the performance I attended, Joshua Challenor, gave a very unsophisticated performance and did not demonstrate any ability to tell the story other than as an unconnected reciter of text with an adept technical alertness to hearing his cues. This is, I grant only a child actor, in his first exposure on the professional stage, but it seems that Mr Sheedy and/or the other actors have not been able to nuance any truth or complexity from him in his performance. As one of two young people cast in this role, one presumes he is one of the two best young actors, in all of Sydney, that Mr Sheedy and the STC could find available for this pivotal role. (The alternate actor is Rory Potter and I wonder what his commitment maybe, as he won the Sydney Theatre Award for Best Newcomer for his performance in MEDEA). Mr Challenor does not engage us at all - we look and listen, but, do not see or hear anything below the surface of delivery. We are untouched, not ever engaged. The young men in front of me accumulatively restless and bored. Trevor Jamieson as Fingerbone Bill, is best when his own personality can be freely revealed, but as an actor, immersed in character, really talking to and being affected by the other actors, he does not appear to be very comfortable or at ease. Mr Jamieson is a winning personality but does not have much complexity, depth or insight into the dramaturgy of the character. In this case his winning presence is not enough for the play to work - one recalls, particularly, his contribution to Big hART's NAMATJIRA, a few years ago, and THE SECRET RIVER earlier this year, and wonder what maybe the problem that prevents Mr Jamieson to have similar ownership and belief in Fingerbone Bill. The same is true of Peter O'Brien as the damaged father figure, Hideaway Tom. He has the rugged good looks and pungency of a loner, but draws, barely, a pencil thin outline to the character's story and inner psychological journey and does not demonstrate any ability to engage the other actors into the sphere of the world of the play. What we have, on the night I saw the production, are the three principal actors, in three isolated worlds, reciting text automatically, into the void of the theatre space, to give us, only, a continuity of narrative. There is no real connection between any of the actors and so a complete disconnect from the power of the human developments of the wonderfully wise Storm Boy and BIll and Tom of the novel and the film. It is, relatively, a very unsatisfying experience. The work that Mr Sheedy has been able to elicit from these actors to bring "these beautiful characters to life" fails completely. 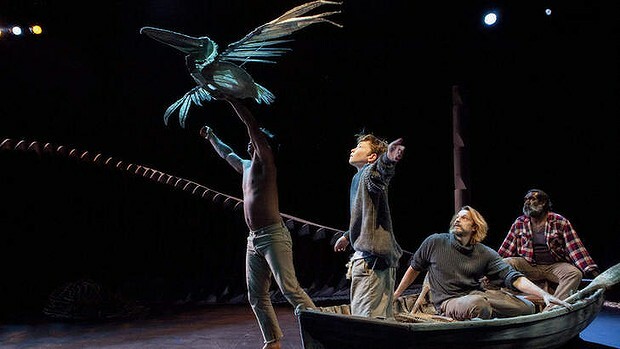 Without the mesmerizing presence of Mr Smith and Mr Cook and the puppetry that they splendidly execute, STORM BOY, in Wharf 1 at the STC, would have been a completely disappointing exercise. It is truly a shame, for all the other elements are primed for collaborative impact, especially, the will of collaboration from the expectant audience. One can feel that excitement drain during the performance time. Dwindle to polite applause and, it mostly, for the pelican puppets and their enablers. Belvoir with their children's production of THE BOOK OF EVERYTHING and PETER PAN struck, mostly, a balance of transporting delight for both child and adult. STORM BOY could have that in another production, another time. I am sorry to report this as my experience of STORM BOY at the STC, but then NATION at the National Theatre was also a disappointment - you can't always win. What is the next offer, I wonder. I find it interesting in the argument about new works and adaptations that adaptations from novels seem to get a more generous treatment than adaptations from other plays ("Book of Everything", "Secret River", "Cloudstreet"). Just wondering if you have any thoughts on this?